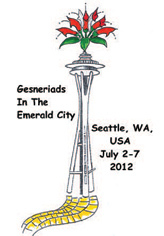 Members and guests from 8 countries and 25 states followed the yellow brick road to the Emerald City of Seattle to attend the 56th Annual Convention of The Gesneriad Society. The Puget Sound Chapter welcomed the 180 registrants, which included over 30 first-time convention attendees. Many enjoyed a pre-convention trip on Monday to the Glass Museum in Tacoma followed by a trip on Tuesday to the Rhododendron Species Garden and Bonsai Collection in nearby Federal Way. The closing trip on Saturday featured a cruise on Puget Sound to Blake Island to enjoy a salmon dinner and traditional Tillicum Village stories and dances. The Renaissance Seattle Hotel provided not only quality meeting space, rooms, and services, but also a great downtown location to explore the cuisines, sights, and sounds of the city. The host chapter’s informal social on Wednesday night high on the 28th floor concluded with a bird’s-eye view of Seattle’s Fourth of July fireworks display. A full convention program included four lectures: “Tissue Culture” by Steven McCulloch, “Gesneriads of South China” and “Conservation of Gesneriads of South China” by Professor Wei Yi-Gang, and “Sinningia Farming in California” by Alan LaVergne. Three mini-lectures were given by students awarded grants to attend convention: Cassandra Coleman (University of Alabama) presented on Gasteranthus phylogeny and pollinators; Jeremy Keene (Ohio University) presented on Monopyle from Central America; and Laura Clavijo (Colombia / University of Alabama) presented on Drymonia diversity and patterns of evolution. There also were three mini programs: a discussion on growing Streptocarpus led by Bob Counsell and Paul Lee; a hands-on workshop all about seed with Karyn Cichocki, Nancy Kast, and Dale Martens; and an overview of David Zaitlin’s recent trip to Brazil to observe Sinningias. Many registrants also attended a conservation meeting/discussion (led by John R. Clark), a Growers Forum (led by Ben Paternoster), a GHA meeting (led by Dale Martens) including a presentation on gesneriad hybrids in Taiwan (by Vivian Liu), as well as judging school and other activities. There were 210 entries from 45 exhibitors in the high-quality flower show where many entries received high scores and several new and lesser-known gesneriads were seen. The crafts entries this year were creative and well executed, and the artistic entries effectively depicted Dorothy, her friends, and her adventures in Oz. At plant sales, as well as at the auctions and the GHA meeting (and other giveaways and shared plant material), somewhere over the rainbow in Seattle gesneriads were found, more precious than gold. All too soon it was time to return home with wonderful treasures and lasting memories. The members of the Puget Sound Gesneriad Society are happy to invite you to participate in the following pre-convention and convention tours. With so much available to see and do in the greater Puget Sound area, we are offering an optional pre-convention tour on Monday, July 2. We will travel by bus to nearby Tacoma to experience contemporary glass art in a breathtakingly beautiful museum on the city’s revitalized waterfront. You will feel the heat as you watch a team of artists create masterpieces from molten glass in the world’s largest hot shop (housed inside the iconic 90-foot stainless steel cone) and marvel at edgy and inspiring exhibitions of glass in the galleries. With its striking architecture, majestic outdoor art installations, the remarkable Chihuly Bridge of Glass, and the finest museum store around, the Museum of Glass is Tacoma’s cultural landmark. On Tuesday, July 3, we will take a short bus trip to Federal Way to enjoy an afternoon at the Rhododendron Species Botanic Garden – 22 acres of botanical splendor and home to one of the largest collections of species rhododendrons and azaleas in the world. On a guided tour, we will learn about these extraordinary plants growing in a forest of conifers and deciduous trees. In addition, we will see myriads of beautiful companion plants including ferns, maples, heathers, and perennials as well as hundreds of tropical beauties set alongside a stream, waterfalls, and towering boulders. At the center of the garden visitors can enjoy the expansive overview of the landscape from the charming gazebo and then explore the Fern Stumpery, Alpine and Pond Gardens, and the breathtaking Meconopsis (Himalayan Blue Poppy) Meadow. Our tour will also include a visit to the Pacific Rim Bonsai Collection, which features 60 outstanding bonsai from six Pacific Rim nations. Saturday evening, July 7, we will enjoy a Northwest native cultural experience. The trip will begin with a 45-minute narrated cruise from downtown Seattle to Blake Island State Park. Upon arrival at Tillicum Village, we will be greeted with an appetizer of steaming clams in nectar. Inside the longhouse, we’ll watch as whole salmon are cooked over an alder-wood fire on cedar stakes in the traditional Northwest Coast Indian style. We’ll then sit down for a fabulous salmon buffet meal followed by a show highlighting the Coast Salish tribes through historical Native American dance combined with modern native storytelling and symbolism. The ancient native culture is married with modern technology in a twist that creates a unique and compelling native cultural experience. After the show, there will be free time to explore the grounds and gift shop before we cruise back to Seattle. There’s no place like convention ….